Are we tough enough on drunk drivers? In American criminal jurisprudence, intent is a major factor in how we punish antisocial behavior. Killing someone intentionally is punished differently than doing it recklessly. Ever since it was invented, the automobile has been an instrument of carnage on our streets and highways. Drunk driving has killed more Americans than all of our wars combined. But a fatal DUI accident usually gets the culpable driver a couple years in prison at most. The reason for our relative leniency toward drunk drivers is obvious: That could be us in the defendant’s dock. Most Americans drive, most Americans drink, and an awful lot of Americans have found it expedient to get behind the wheel after having a few on at least one occasion in their lives. And, we mostly view these tragedies as unfortunate accidents, not premeditated murder, although there has been somewhat of a trend in recent years toward cracking down on drunk drivers who kill or seriously injure others. Even so, the criminal penalties for killing someone with a car remain relatively light in our society. If you have been in an accident with a drunk driver then you could be entitled to compensation, you can Learn More here if you are interested. It’ll be interesting to see whether today’s spectacular DUI accident in Oklahoma arouses the public enough to change that. 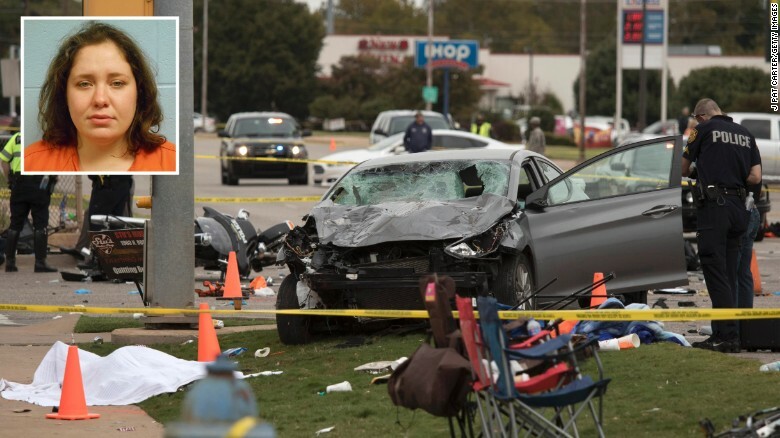 Police say Adacia Avery Chambers, 25, of Stillwater (photo above) was intoxicated when the car she was driving plowed into Oklahoma State University’s homecoming parade, killing 4 people (including a baby) and injuring 47 more. That’s 51 people mowed down by one car, and one allegedly alcohol-impaired driver. Assuming, for sake of argument, that Chambers was drunk and will be charged and convicted of vehicle manslaughter or something similar, it’s a leadpipe cinch she won’t get the death penalty or even life in prison for this mayhem. I recall a case in Washington State back in the 1980s when a young woman, driving while impaired by alcohol, ran over and killed three boys on bicycles. As I recall, she served two years in Purdy, the Washington state prison for women. Prosecutors will try to throw the book at Chambers. If she’s guilty and is convicted — she’s entitled to due process, and these things remain to be determined in a trial or by a guilty plea — the consequences for her will be unpleasant. She’ll go to prison for several years, may be permanently banned from having a driver’s license, and will lose everything she owns to pay attorney fees and legal judgments. But even though the press may call her a murderer, the legal system won’t. It was an careless accident, you see, not a deliberate crime. Nevertheless, drunk driving affects everyone, it affects the driver, those who are caught in the accident and their families. If you have been charged with a DUI or a DWI, you might need someone like philadelphia criminal lawyer or, depending on where you live, a lawyer local to you, who might be able to defend your case. A drunk driver can also affect your insurance, although it depends on your company, however, some have known to invalidate insurance for the person who drives drunk. How does it affect someone who is hit by a drunk driver and how will it affect your car, or van insurance? It might be worth contacting your insurance company to find out. I wonder what would happen if a country with less legal finesse than ours simply stood drunk drivers who kill people against a wall and shot them? No process, no trial, just — bang! — you’re dead. Would other people still drive drunk in that country? Firing squads don’t seem to stop drug smuggling, so my best guess is yes, they would. It is what it is. Although many tears will be shed for the victims, we won’t do that to Chambers. She is, after all, someone’s daughter or sister or maybe even mom. She could be us. We don’t have it in ourselves to think of her as a monster. Update #1: Chambers, who is charged with four counts of second-degree murder, now has a lawyer. He says she wasn’t drinking or on drugs, but is mentally ill. That’s for qualified professionals to determine, of course, and no opinion is expressed here. Regardless of how that may turn out, my point about drunk driving remains the same. Posted 24 Oct 2015 by Roger Rabbit in Misc.